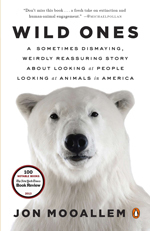 Journalist and writer Jon Mooallem, a recent transplant from California, is the author of Wild Ones: A Sometimes Dismaying, Weirdly Reassuring Story About Looking at People Looking at Animals in America (2014). 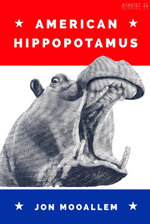 The book has won numerous awards, among them Best Book of 2013 by The New York Times Book Review. Mooallem says about his book that he has watched his little daughter’s world overflow with cute depictions of animals - while the actual world she’s inheriting slides into a great storm of extinction. Half of all species could disappear by the end of the century. Mooallem decides to venture into the field, often taking his daughter with him, to move beyond childlike fascination and make those creatures feel more real. Wild Ones is a tour through our environment and the eccentric cultural history of people and wild animals in America that reflects it. With propulsive curiosity and searing wit, and without easy moralizing, the book merges reportage, science, and history into an endearing meditation on what it means to live in, and bring a life into a broken world. 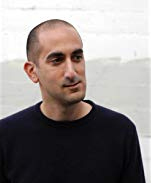 Mooallem is also the author of American Hippopotamus (ebook 2013), and a contributing writer to The New York Times Magazine, The New Yorker, Harper's, Wired, and many other magazines. For more information go to https://jonmooallem.com/.